A gang of monkeys made their home in a mountain slope. When winter came, it brought not only severe cold but also heavy rains. Unable to stand the cold, the monkeys collected red berries wildly growing in the mountain slope. They gathered around the berries and began blowing air at them thinking they were embers. 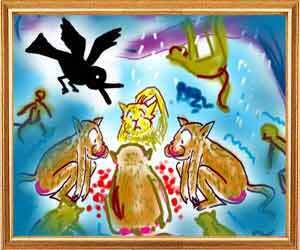 Disregarding the old monkey's anger and not giving room to any other monkey to talk, Suchimukha went on repeating his advice to them to seek shelter elsewhere. Tired with the bird's unwanted advice, one of the monkeys sprang at the bird and bashed him against a rock till he was dead. 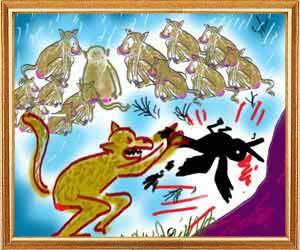 At Damanaka's request, Karataka began telling the story of the evil monkey.